Two people were found dead Wednesday in a Batavia cemetery — victims of an apparent lightning strike. Police were called around 3:30 p.m. to the cemetery, where two bodies had been discovered. "The storm blew through probably 3:30 in the morning and they were found 3:30 in the afternoon," said City of Batavia Police Department Detective Sergeant Todd Crossett. Investigators, with the help of the National Oceanic and Atmospheric Administration, determined the lightning strike had occurred in the area where the pair were found. An autopsy determined the victims, identified as 34-year-old Richard Garlock and 32-year-old Jenea Macleod, had been struck by lightning as the victims had injuries consistent with a lightning strike. Police say this is rare to see. 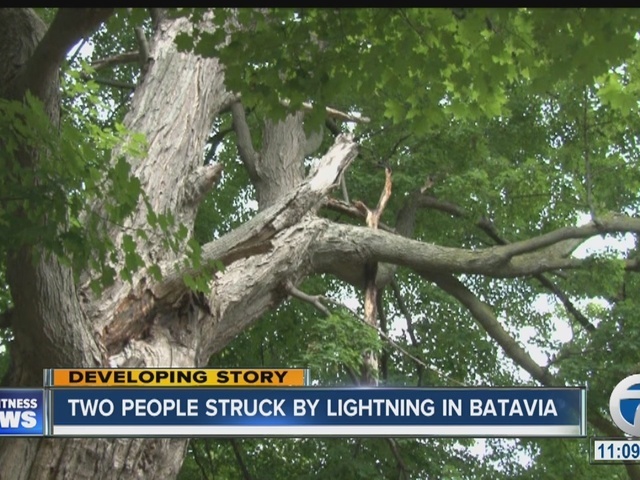 "This is the first time I have ever dealt with somebody struck by lightning," said City of Batavia Police Department Detective Eric Hill. "I know for the rest of the bureau, they haven't experienced it either." Detective Hill adds there was drug paraphernalia in the scene but no indication it was used. "This doesn't seem to be related to any overdose at all at this point," said Detective Hill. "We're not certain of that but we'll have more information when toxicology comes back." Those results could take 60 to 90 days.